A cataract is the clouding of the crystalline lens of the eye which often affects the clarity of vision. Generally, it’s a function of maturity, or aging, as a clear lens in the eye becomes opaque and foggy. Just about everyone will develop cataracts if they live long enough due to normal exposure of UV light from the sun. Posterior Subcapsular Cataract Posterior Subcapsular Cataract This type of cataract occurs in the back of the lens. People who have diabetes or are taking a high dose of steroid medicines have a greater risk of developing a posterior subcapsular cataract. Nuclear Cataract These cataracts form deep in the central zone (nucleus) of the lens and are typically associated with aging. Cortical Cataract Another age-related type of cataracts characterized by white, wedge-like opacities. This type of cataract occurs in the lens cortex, which is the part of the lens that surrounds the central nucleus. Traumatic Cataract Cataracts that develop after an eye injury. Congenital Cataract Some babies are born with cataracts or develop them childhood, often in both eyes. These cataracts may be so small that they do not affect vision. Cataracts can be caused by a number of factors. Some inherited genetic disorders can increase your risk of cataracts, as can medical conditions like diabetes. However, most cataracts are the result of normal aging or an eye injury. The lens, where cataracts form, is positioned behind the colored part of your eye (iris). The lens focuses light that passes into your eye, producing clear, sharp images on the retina – the light-sensitive membrane in the eye that functions like the film in a camera. Cataracts generally develop in both eyes, but not always evenly. The cataract in one eye may be more advanced than the other, causing a difference in vision between eyes. Who Should be Checked for Cataracts? Cataracts are typically associated with aging, but anyone with these risk factors for cataracts should be checked. Visual Acuity Test.This test uses an eye chart to measure how well you can read a series of letters. Your eyes are tested one at a time, while the other eye is covered. 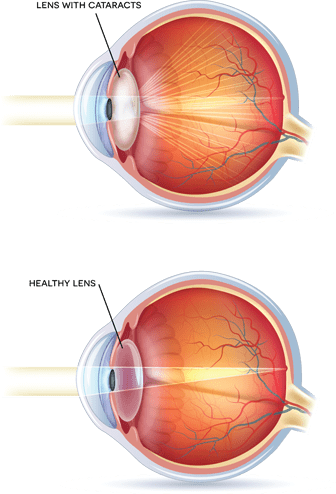 Using a chart or a viewing device with progressively smaller letters, your eye doctor determines if you have 20/20 vision or if your vision shows signs of impairment. Visual acuity tests can be done under normal lighting conditions or with added glare. Slit-Lamp Examination.A slit lamp allows your eye doctor to see the structures at the front of your eye under magnification. The microscope is called a slit lamp because it uses an intense line of light, a slit, to illuminate your cornea, iris, lens, and the space between your iris and cornea. The slit allows your doctor to view these structures in small sections, which makes it easier to detect any tiny abnormalities.